For three days at the end of 2009 we were lucky enough to attend the wedding of some dear friends we've met in Caracas. They got married in a beautiful ceremony on New Year's Eve in Austin, TX. The morning of the wedding we also had the fortune of taking a quick day trip to San Antonio, where Kenny fulfilled a long held desire to visit the Alamo. We have been very blessed this year and are grateful for the many wonderful opportunities 2009 has afforded. We look forward to what we hope will be an equally eventful, exciting and unexpected 2010 and send each of you our love and best wishes. That river walk looks fantastic. Would you recommend San Antonio for a getaway? My husband and I are trying to figure out a fun new place to go. 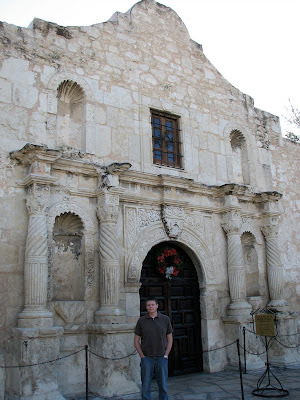 We went to San Antonio last summer. What a great city. I have never been there but Mike has. He LOVED the whole area. you were in austin?! I'm so sad we missed you. Fun trip! Lucky! That's one place I have yet to visit. so what trips does 2010 have in store for you? please say seattle, because we're moving there. you can come and visit!! YOu have a fun life with all of your traveling. And that Mango ice cream is making my mouth water right now!